Your iPod is ideal when you’re on the go. But when you’re hanging around the house, wouldn’t it be great to fill the room - any room - with incredible sound? Introducing the Altec Lansing M602 powered audio system. It’s the complete package: Striking good looks, plus rich, clear sound from its four custom-designed speakers. What’s more, the M602 is surprisingly affordable, so you can still send the kids to college. Just place your iPod into the M602’s built-in dock and enjoy. Digital amplification delivers powerful sound from a compact system. Four specially engineered full-range neodymium speakers smoothly deliver a full spectrum of pure, distinct sound. XdB™ bass-enhancement technology creates deep bass without a subwoofer. iPod and speaker functions (play, forward, back, volume, bass, treble, and stand-by) are at your fingertips. Just sit back and enjoy! Looks great in your living room or mounted on wall. M602 speaker system, universal MP3 cradle, auxiliary MP3 cable, remote control, user's manual. 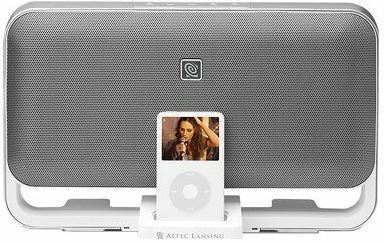 The inMotion iM500 powered speaker system from Altec Lansing is sleek, compact, and amazingly thin — much like the iPod Nano it's designed for. Although only 3/4" thick — about the width of three pencils — the system delivers a clean sound with surprisingly full bass. When connected to AC power, the iM500 automatically recharges your iPod Nano. And you can plug the system into your computer with an optional USB cable and sync your player while its docked. With six "AAA" batteries (not included), the iM500 can deliver up to eight hours of continuous play. 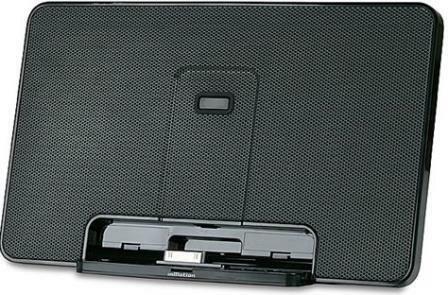 The system folds flat for travel, and comes with its own soft carry case. • Drivers: The inMotion iM500 features two custom-designed full-range drivers. • Amplifier: A highly efficient Class D amplifier powers the full-range drivers. • MaxxBass: MaxxBass technology creates quality bass without a subwoofer. • Built-in Docking Station: The built-in docking station provides the same synchronization, data transfer, and recharging options as your iPod dock (USB cable not included). • Power Options: This unit can be operated using AC power or six optional "AAA" batteries. When using "AAA" batteries, the inMotion iM500 can play for up to 8 hours. • Auto Shutdown: During battery-only operation, the inMotion iM500 automatically shuts down if no audio is detected for up to three minutes.